Homepage › Forums › Sevilian Watering Hole › Refugees gather here! This topic contains 61 replies, has 15 voices, and was last updated by AdmiralMemo 3 years, 8 months ago. Made it across the gap… it’s a shame to see the old SB succumb to the spam, but I suppose it’s time to move on. Nah I don’t think I have anything from the ancient SB anymore, sorry. 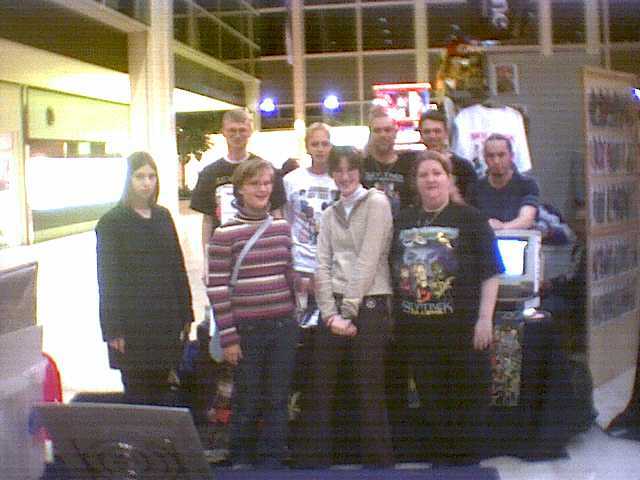 I do still have a snapshot of Sev from like 2001 or so somewhere online. Perhaps I should put it online for nostalgia, but I dunno if John would be happy about it. I dunno, I never heard anything back from him when I asked about it. I see the site is down too, has been for a long time. I guess I’ll just put the old thing back online, so we can at least still enjoy the comics. If John ever finds out and complains I’ll take it down. Oh, I made you a keymaster or whatever in this new forum system so you can bug people and remove forum posts and stuff. The new smart captcha we have in place for user registrations should be enough to keep the spammers out, but you never know. The hey-days were fun! I hope this new world gives us a new beginning! Well, this will take some time for me to get used to. Ah well, managed to sign up and get a temporary avatar/user image thingie whatsitcalled up there, so it can’t be all that bad. Apparently I move to fast for the board. Move too fast? Did something go wrong? I think I tried to post two replies in too short a time. To. Took me a while to decide which username to register with. Feels kind of weird to go back to EofS, but I couldn’t bring myself to register as EofW. Just felt wrong. Yeah, but that’s not my full name. That would be like putting just Emma on my passport. Hi everyone. Long time no Sev see! Johan, in terms of any ‘old’ Sev look, do you not have the version of Sev you uploaded to my work laptop for SevCon 2002 in MK? That was a copy of the whole site that we could run remotely as a demo, right? Well, did you click the ‘Sev Archive’ link yet? Because that, as far as I know, is the old sev look. Or was there even older? I forget. I don’t have an older copy than that one, in any case. Johan, I think that look was just about the last version I saw of Sev. There was a look and feel before that one, which is the one we demoed at SevCon. I am back row, centre position. Who esle? 🙂 Oh and the camera? I have nooooo idea. I think it was scanned in using a potato. I think I’m second from the right, back row. The guy that wouldn’t stop trying to kill people is all the way on the right. That must be from the Friday night, which would narrow down who can have taken the pic a lot. In fact, looking at who’s there… Was it taken by a randomer perhaps, that someone gave the camera to? Back row – great wizard, …don’t know…, 247, dummy, Miguel? Sean – 6 of 9 (no, that’s not a new character) – see me after class. 6 of 9? Not 5618? Or am I mixing things up? Probably, I’m not good at names. 7 of 9 – you know, I never really saw the appeal. Kes on the other hand……..in leather……….narf……….. I suppose it helped a bit with the ratings, but sometimes it was a bit too much focussing on becoming an individual versus being a part in a larger collective thingie. A bit like the moments in TNG about Data trying to become more human. Dunno if I’d prefer Kes or 7 in the show, though kes’ voiche was a bit lower pitched and softer. I’d have to see the series again to decide. Purely for research purposes, of course! Sadly this photo was taken the night before EofS and I arrived, so not me on the right! Can name all (since I was there! ), not many left here regularly though. Nemi’s still around on the board occasionally, will prod her this way. Yes ja oui jo sí! There are not enough ways to say yes to indicate how much I would like them. I forgot the name of the guy that wanted to kill everyone all the time, all the way on the right. Can anyone remember? No, not really. Wish I could have been there. It was Agent-D. He camped in a tent on the lawn outside the front door at Tickford Abbey. IIRC he soon afterwards rather unceremoniously parted company with Sev altogether after some kind of altercation on the old SB……. He was a little too kill-happy to me, to be honest. Agent D.. hm. I should know that but I still don’t quite recall. Oh well. Memory goes with age! Anyways, glad to see there are still some people around that drop in, even if very irregularly, just to keep in touch. We’re already more like 15 years on from when Sev was at its height, and maybe in another 15 years we’ll still drop in occasionally to keep in touch. It’s a small world. That picture made me realise that about a month ago I passed the point where I’ve been in Sev for half my life. I joined in January 99, a couple of months shy of my 15th birthday. Now I’m a couple of months shy of my 30th. Similarly, when the Sev Trek Movie was released and Guido <strike>totally accidentally</strike> was the first to order, I grumbled that I had been online at that same time (before school) but couldn’t order until later because I needed my dad’s credit card. Guido pointed out he was old enough to be in control of his own finances, I pointed out that I was young enough to be in control of my bowels. Oh but he sweeears it was accidental. Oh well, we’re married now. His print stating he was first is now my print too. I mean, it’s an extreme length to go to just for the bragging rights and it’s taken me over a decade but at last my quest is complete! Um, only HALF of it is yours, although you do have a reasonable shout at taking part of his pension along with it……. I’ll take the half which has the 1 on it then. No preview option either…. hm. There’s a lot of work to be done here. Well I didn’t make it and I don’t know who did, but maybe I can edit it if I install ps or something. Except there’s no room for that because of Steam sales. Boo, I was trying to be clever and I failed to remember Wizzard with two z and that dummy was NovaFlash before even though he’s using it again now. The one who left Sev doesn’t get to keep his nickname though. All coloured names must be checked at the exit. Do I count as a refugee? Is everyone from the old voting days still around? Well, define everyone and define old ;0) I’m far too young to have been an Old Fart, and yet I ventured onto the SB 14 years ago. The Great Wizzard’s not on the board any more (hasn’t been for many years) but I’ve married him, so I keep him filled in on the gossip. Heh. Let’s define “everyone” as “those who (at least semi-) regularly showed up in the irc channel on friday(/saturday) for the voting sessions. I swear the only name I can remember right now is EofPi, or something along those lines; but it has been years, and I never showed up on the forums, I found the style lacking in overview. Oh, and just for the record, I *think* my nickname back in the day was CptThomas, but since it’s been so long and I rarely used that name elsewhere, I dropped the Cpt part. e of Pi was a very different person to me, heh. Although we did used to get mixed up – not least because he was known as e and I was E. I was very active in the judging sessions, ran more than a few of them, but only from 2001 onwards. I certainly remember you with the Cpt in front of your name. Nice to see you again, how’s things? Whatcha doing in London? Since I’ve never been there, it should be fun. Hi ! Ok, I’ve made it too, nothing like a NovaFlash joint to hang around in. Uh-oh. Two more have found their way. Life as we know it, is over! I remember running judging sessions way back when. My favorite was the first time I did it. Dummy was helping me, so I could learn, and the first thing he did was delete all the punchlines. Haha.